We carry a wide variety of products in the retail area of our clinic. 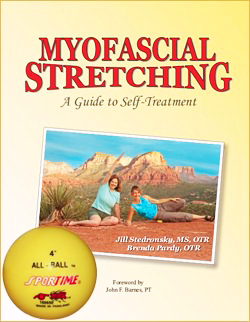 Myofascial Stretching is a unique self-treatment technique that follows the principles of Myofascial Release (MFR) as developed by John F. Barnes, PT. It results in permanent lengthening of the body's connective tissue and can dramatically improve health and quality of life. The techniques employ sustained pressure using a small inflated ball and active elongation into restrictions in the fascia. These two methods complement each other. This book was written for both the lay person who has chronic pain, muscular tightness and/or postural dysfunction and for clinicians to give their patients for home exercise programs. It will benefit anyone with pain or tightness. It can also eliminate many of those aches and pains that you were told are part of the "normal" aging process and you just need to live with. Maybe you don't! Copyright © 2008.Lake Region Therapy Services .All Rights Reserved.